What is a non-charitable, not-for-profit company? Under Australian tax legislation, charities can be established using a number of different corporate entities, including companies. For charities to be exempt from income tax, they must be endorsed as such by the Australian Tax Office (ATO). It is also possible to set up a company which is not a charity, but which is established for certain not-for-profit purposes. Companies in this category may perform a self-assessment and determine that they are exempt from income tax. The law on charities and non-profit organisations is currently undergoing a number of changes. The information in this article is correct to the date of writing. Please refer to the ATO website here for the latest information on the not-for-profit reforms. 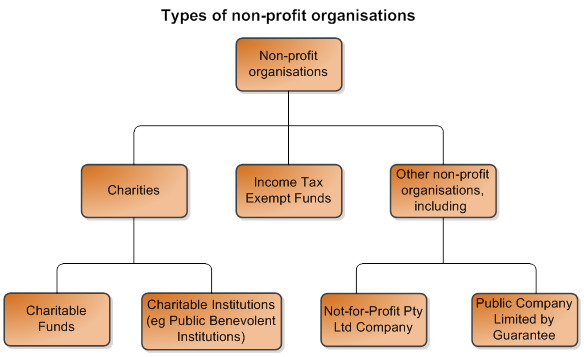 This diagram sets out the different types of non-profit organisations which are recognised under tax legislation. Note that it is possible for Not-for-Profit Pty Ltd Companies and Public Companies Limited by Guarantee to be non-profit organisations which are also charities. An entity must be endorsed by the ATO as a charity in order to qualify for tax concessions. This article discusses the 'other non-profit organisations' category above. The article also looks at how this category differs from the 'charities' category. will shortly allow you to register a Not for Profit Company limited by guarantee. These two types of organisations fall within the category of 'other non-profit organisations'. What is the definition of a charity? other purposes beneficial to the community (such as promoting health or promoting art and culture). And what is a non-charitable, not-for-profit company? it is not operating for the profit or gain of its individual members. To satisfy the second condition, an entity can make a profit however that profit must be used solely in the pursuit of entity's purposes and cannot be distributed to its members for their individual benefit. This condition also applies where the company is wound-up, so that any surplus assets or profits which remain after the company has satisfied its liabilities cannot be distributed to members. To comply with this requirement, the Cleardocs NFP Pty Ltd Company and the Not for Profit Public Company provide that the surplus assets of the company (if any) must be distributed to an entity or entities with similar objects to that of the company in the event of a winding-up. Why incorporate a non-charitable, not-for-profit organisation? If you incorporate a non-charitable, not-for-profit company which falls within one of the categories in sections 50-5 to 50-45 of the Income Tax Assessment Act 1997 (ITAA97), you are then entitled to perform a self-assessment and determine that the entity is exempt from paying income tax. Common categories of not-for-profit organisations that fall within sections 50-5 to 50-45 of the ITAA97 are community service organisations and cultural organisations. Specific examples of not-for-profit companies are sports clubs, community service groups and recreational clubs. Can a non-charitable, not-for-profit company be a trustee? Yes, a non-charitable, not-for-profit company can be a trustee. However, it is the activities and constituent documents of the trust that will determine the tax treatment of the trust rather than the trustee. You should seek legal advice on your preferred trust and corporate trustee structure and the associated tax implications. the "SMSF Trustee Only" product (appropriate for use only as a trustee of an Self Managed Superannuation Fund). For questions or more information about the above article, please call Maddocks in Melbourne on 03 9288 0555 and ask for a member of the Corporate and Commercial or Tax and Revenue Teams. You can read other articles concerning companies and not-for-profits here. Order the Cleardocs Company Registration package here.